Encourage the maintenance of non-ABMC monuments and markers in such foreign lands. The ABMC doesn’t manage U.S. National Cemeteries (see the Department of Veteran’s Affairs here). ABMC has responsibility for 27 burial sites and 22 monuments in 17 countries (plus three monuments in the U.S.) and there are 124, 956 Americans buried in ABMC-managed sites. The agency is governed by a commission of up to ten members plus a chairperson and a secretary (who must be a U.S. Army officer), all of whom are appointed by the President to indefinite terms. The chairs have always been high ranking generals of the Army, Air Force or Marines, although this is a tradition rather than a requirement. Well-known chairs have included Gen. John J. Pershing (1923 – 1948), Gen. George C. Marshall (1949 – 1959) and Gen. Mark W. Clark (1969 – 1984). The current chairman is Gen. Merrill F. McPeak, USAF (ret.) and the current secretary is Col. Robert D’Alessandro USA (ret. ), who is also a commissioner of the U.S. WW1 Centennial Commission. The ABMC is currently authorized to have 395 full-time employees, it is headquartered in Arlington, VA and has a major office in the Paris ‘burbs. Over its history, the ABMC has taken over U.S. military burial sites in Mexico, Panama and the Philippines as well as the Lafayette Escadrille Memorial in France last year. During the 1920’s the ABMC was very busy in Europe with the establishment of the cemeteries and the repatriation of remains. Much of the work was done by U.S. Army personnel on temporary duty. 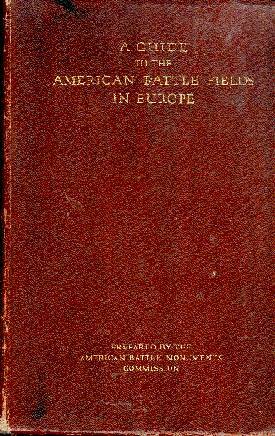 At the same time many of these persons (including Maj. Dwight Eisenhower) produced the 590 page tome entitled American Armies and Battlefields in Europe, an exhaustive history which has the advantage of having been written by persons who actually lived through the experience, when it was still pretty fresh in everyone’s mind. 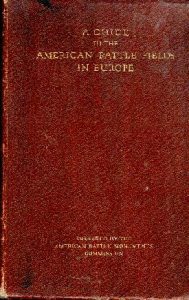 First published in 1927 and re-released in an updated and expanded edition in 1938, this became the most authoritative source of information about the American Expeditionary Force, and has long been known to historians and enthusiasts as ‘the Blue Book’ (the 1938 edition had a blue cover). For over seventy years, if you had a copy you were fortunate, and even if you, like me, only KNEW someone who had a copy, you considered yourself lucky. But a few years ago all of that changed. Virginia Tech has digitized the entire work and it can be either searched or downloaded to your computer FOR FREE from several different sources, including the U.S. Army, the ABMC and the National Archives.